The story of Detroit and its shrinking dynamics is documented in many articles and books. The city already faced a clear decline prior to the subprime crisis, mainly due to the changes in the automotive industry that undermined its original primacy, but that crisis increased the problem to the extent of leading to the highest foreclosure ratio among the 100 most populated US cities. Over 67.000 properties have been foreclosed, and 65% remain vacant. So it may be of interest to look at hard numbers of a Plan that, overall, leads to an allocation of 30% of all the federal funds received to demolition of an excessive housing capacity with the aim to stabilize a city in a deep crisis. The city must reduce its physical size to cut maintenance costs and be again viable. 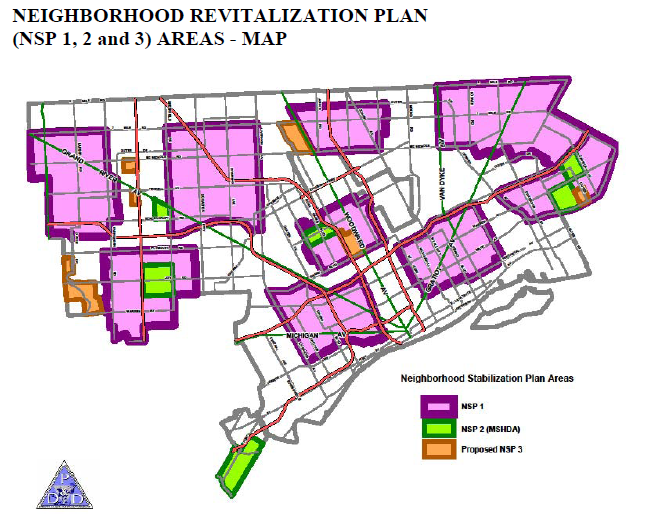 In 2010 the US Department of Housing and Urban Development granted to the city of Detroit a third round of funding from the Neighborhood Stabilization Program (NSP3, a nationwide initiative facing the subprime crisis) for the purpose of stabilizing neighborhoods by the reduction or elimination of vacant and abandoned residential property in targeted neighborhoods. The allocation amounted to $21,922,710. The activity report from january to march 2013 states that the city has currently allocated $2,192,271 to demolition. During the first quarter, potential NSP3 demolition sites were identified that would complement other NSP investments. Developers selected by the City for rehabilitation activity were encouraged to submit lists of blighted properties in the neighborhoods of planned construction for consideration as demolition. There was also conversation about requesting a demolition waiver to exceed the 10% cap. The City is finalizing the details of this change and plan to submit a waiver request to HUD early in the second quarter. The City is also currently exploring an alternative model for demolition and will finalize the service delivery model in the 2ndQTR and commence demolition activity. The City will utilize approximately $15 million of the NSP3 funds to work with developers to conduct rehabilitation for both rental and homeownership projects.